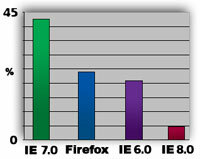 IE 7 is the current browser of choice with Firefox second and IE 6 in third. IE 8 adoption is still slow. Since we didn't do a browser stat review for 2008, we decided to do a review for the middle of 2009 and bring people back up to speed on the browser war. Among the tech field (Site 6) Firefox still dominates and also has a greater showing from the Chrome crowd. Among standard users, many have updated to IE 7. Web developers and SEO professionals (Site 2) are higher than average on firefox adoption and slower on IE 7/8 adoption as well.